One thing that constantly amuses me with Kuching is that businesses here can come up with rather funny names for themselves. Examples include Nemo Bistro in Jalan Ban Hock, or Titanic Lounge in BDC, complete with Finding Nemo and Titanic themes respectively. There's nothing wrong with that, but somehow I'd find it funny if someone were to ask me "Hey! Wanna go Nemo Bistro drink beer?" Hair Port '86 - Silly Name, Serious Hair. 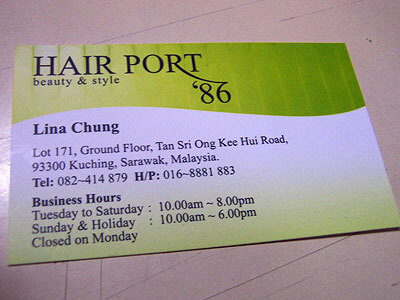 There's a hair saloon in Jalan Ong Kee Hui (near Soon Onn Furniture) called Hair Port '86. The first time I saw that name, I thought "What a stupid name. Hair Port... sounds like AIRPORT! What lah! The hair dryer like aeroplane so noisy one is it?" It did pique my curiousity though. Perhaps Hair Port was meant to be like a central point for all things hair! That's why its named like that. Anyway, I'm about to start work again next Monday and I hadn't visit my hairdresser since before CNY, so I figured its probably time for a hair cut. 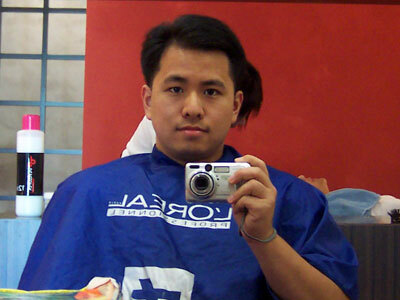 As I'm always up for trying something new, I popped in the saloon earlier today for a hair cut and wash. I am rather impressed by the interior of the hair saloon. The variety of bright colours marry well with each other, and the design of the furniture are all stylish and contemporary. The soothing music playing in the background makes it all the more inviting. 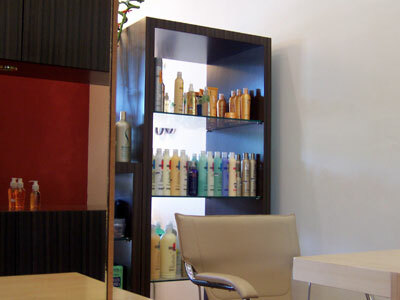 This contrasts other hair saloons I've been to that's usually filled with patches of hair on the untidy floor, and the stench of hair care products permeating through the air. I was greeted by Ling, who quoted me RM30 for a men's hair cut and wash. That's rather expensive by Kuching's standards, but considering a similar 15-minute service in Perth would cost AUD23, I thought the price is rather acceptable. I was seated on one of their comfy chairs in front of the mirror. Ling placed a stack of Cleo magazines in front of me, which I never touched. Here's a shot of me before my hair cut. To my horror, Ling proceeded to pour shampoo and water onto my head while I was still sitting on the chair! Holy Cow! Wouldn't that drench my top? I would have though that they would wash my hair in one of those basin instead. But apparently, that's the SOP for hair wash here. Talk about a culture shock. Somehow Ling managed to defy gravity and removed all the foam from my hair before it reached my tee. I was also treated to a good 20 to 25 minutes of head and neck massage, which was so good it made my neck numb. I was then led to the basin for a rinse of my hair. Ling wrapped a towel around my head, which made me look like Osama bin Laden. This is what I look like after the towel dry. I reminded myself of a young Aaron Kwok. Teehee. 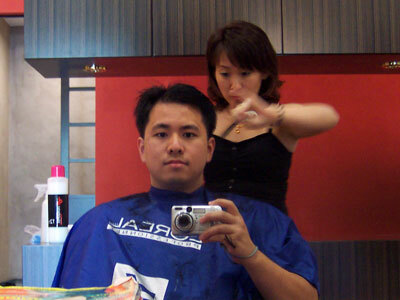 The actual hair cut was done by the taukeh-nio (proprietor) herself, Lina Chung. My hair is done by the taukeh-nio herself. Lina is friendly and chatty. I learnt that Hair Port was established in 1986 (hence the '86 suffix in the name) and used to be located in Kuching Plaza until December last year. As patrons to Kuching Plaza dwindled, Hair Port relocated to this new area. Lina's father is the owner of Soon Onn Furniture, and the interior of the saloon was designed by her nephew Ronald Chung - coincidentally also a graduate of Curtin University. 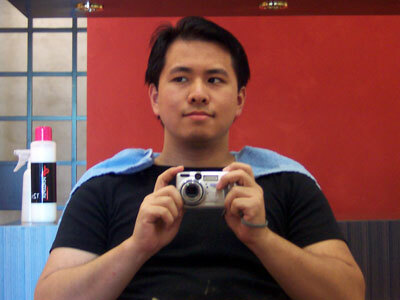 After Lina skillfully snipped and buzzed my hair, I was once again led to the basin to rinse off the residual hair. 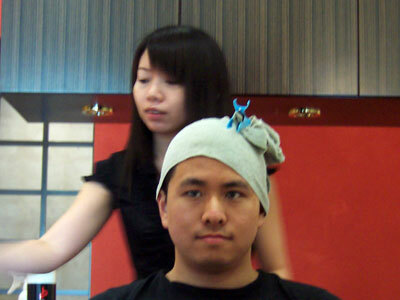 After a blowdry and some minor touch up, Ling returned to apply liquid hair wax on my head. And this is what I ended up like. So what do you reckon? Good? Bad? Or had I just wasted RM30 looking exactly the same as I did before? I like it before. I think the poofiness of the after -haircut makes you look like abit so-hai. :D Makes you make more mature looking also. Look very canggih la the shop, and did they mention anything when you take those photos in the shop? Hsin - Haha! I had a hair cut and I ended up looking worse then I did before? mrkiasu - They thought I'm some reporter. Maybe that's why the massage I received was extra long. MunKit - I know. Make them kintio only. The taukeh-nio even dropped the scissors when cutting my hair. Eh? I thought I went to cut hair, not plant hair? ..Er...Arent washes Always done in the seat?! ^_-"
Pretty good! Your hair, I mean. The girl also! Hehe! I think outside of Asia, washes are done over a sink. It's the same over here in the US also. They always ask, "Water too hot? Too cold?" I love the design of the shop. Do you think they have a franchise here in KL? Bek - Yes, Nigel... I mean, Bek, BEK! Thanks for being the first to say something nice about the hair though. Haha! And hey, don't fret over your new haircut. Some people are bless with a face than go with any sort of hairstyle and you're one of them. Allyssa - Dunno lah. I'm used to having them wash my hair in the basin in Perth. Washing your hair in your seat is like brushing your teeh in the car. You can do it, but its kinda inappropriate. ks - haha! Its a hair saloon, not a massage parlour! meigie - I thought KL have much better saloons over there boasting RM90 per haircut or something? 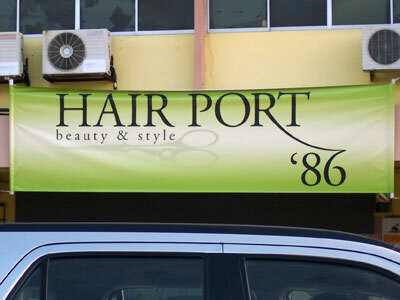 Nah, Hair Port is a small business so I doubt they'll be expanding to competitive KL anytime soon. 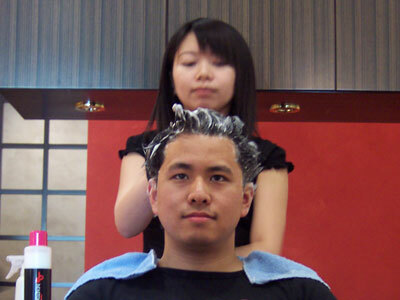 Hsin - The hairdressers in Perth would ask me, "Am I too hard? Should I go harder?" which makes me think dirty thoughts. it looks puffier lah kenny, hm. mebbe needs a bit of goo in it? rm30's a bit steep though. even chaboh hair cut plus wash and wadever is around tht price only. of course this is not inclusive of those super popular ala sheldon saloons. Wow...I didn't know that you live in Malysia. and I introduced this site to my friends. err, shouldn't it be Hair Salon? anyway, i'm reading all your archived posts..so this comment comes too late.. >_err, shouldn't it be Hair Salon? anywayz, this post was REALLY surprising. 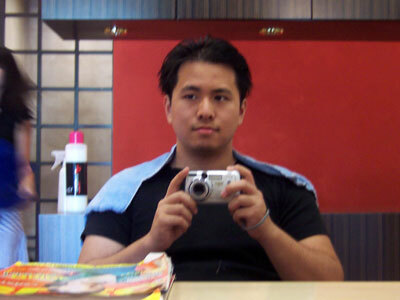 I've been going to hair port ever since i was twelve. And yea the place is nice. Its not stuffy, the interior is modern--look at the walls--- its flly airconditioned...uhrm...its not stuffy!!!!! and btw, Lina oways handles d cutting and trimming and layering and everythin else dat wud involve scissors. but if u were to dye, r curl, r straighten o anythin lidet, one of d guys o gurls wud do it 4 ya. Talc Industries is Proud to introduce himself for top quality Manufacturer and Supplier of Hair Dressing Scissors Since last two Decades. Recently our management decided to expand it. Therefore we are writing you for your kind attention to quality Hair Dressing Scissors. If required - Mirror Finish, Cobalt Click - Plasima Coating So Available. With these specification prices competitive. We hope that we will be appreciated by you. P/o Gohad Pur, Bonkan. Sialkot. wah kao . . .
cheaper for a student hair cut ! ! ! We are introduced our selves as manufacturer and exporters quality of Barber Scissors, Thinning Scissors, Left Hand Scissors, Pet Grooming Scissors, Multi Colors Scissors, Nail Scissors, Cuticle Scissors, Nail Cutters, Nail Nippers, Tweezers, Optical Pliers, Footfiles, and all instruments manicure & Pedicure for the last many years, Your Need is our Preference and your satisfactions is our satisfaction. We do our all process start Forging , Cutting, Fitting , Polishing, under the technical persons for our great customers requirements, with lowest possible prices, and we can also make for you any quality in any quantity intime delivery and we are guarantee rust proof of our products. It is our great desire to start business with your honorable Organizations and we special offer to importers and distributors to check our products to the other suppliers. If you have need any samples of our products do not hesitate ask immediately and also we can send you as per your requirements through fast courier service. Try us we will provide you all business informations about our products for your considerations. looks so nerdy than before. We are very happy to introduce our Beauty items Barber Scissors, Thinning Scissors, Grooming scissors, Embroidery Scissors, Tailor scissors, Acrylic Nail Clipper, Nail Nippers, Cuticle Nippers, Eyebrow Tweezers, Nail file, Manicure Set, Cuticle scissors, Leather cases, Blackhead remover at affordable prices. Our whole line of products is manufactured with the highest quality and latest technology. Lumines Beauty is company having good expertise of manufacturing and supplying the Manicure, Pedicure, Tc instruments all over the world since 1983. So could you have desire to check our quality as Physically ,if yes then let us ask for producing Counter Samples ,so don't hesitate to get back to us . and assorted Scissors, for a protracted period of time. We trust that you won't hesitate to float your inquires on the above items. Manufacturers & Exporters of all kind of beauty instruments. Brandt Surgico was established in 1956 in Sialkot, Pakistan. We would like to introduce ourselves as a leading manufacturer and exporter of all kind of Beauty Instruments. We pledge that in the years to come we will make all the possible efforts not only To keep up with our current quality standards but also to further improve them to meet the modern challenges in this industry, For this purpose we have developed Human Resource Department for latest market trends and quality control. We always offer rock-bottom prices because we have our own Manufacturing units. All of our products made in our own premises. In case you prefer to have any clarifications please feel free to write us and we shall be happy to do according to your wishes. Please visit our website for online catalogue. Samples are available for your review. We are writing to introduce ourselves as one of the most professed manufacturers and exporters of Groomer,Manicure,Beauty Instruments and assorted Scissors, for a protracted period of time. Backed by the latest machinery and equipment, we have been rendering our services to our valued foreign Customers precisely conforming to their specifications and designs. We trust that you won't hesitate to float your inquires on the above items. We shall provide samples, where necessary, for your expert perusal and subsequent comments. We now look forward to hearing from you at your prompt convenience, with best regards. We are pleased to introduce you our company as a Manufacturer & Exporter of high quality (Beauty care, Skin, Hair & Health Care) and all sorts of Scissors and many more items made of pure Stainless Steel in a wide range of variety and designs. We are professional manufacturer and exporters of Haircutting scissors in all sorts and Grades like 440c and 420c, better Rockwell 56 and up nice color, Nail care, manicure, pedicure in all qualities and designs as per requirement. Hahaha, I was wondering where it was and finally it turns out to be in Malaysia. The interior of the "Port" looks nice.